Finally summer has started. Fussy eaters at home and you don’t know what to prepare for breakfast everyday for them. Especially for me, I have a preference for my child to start his day with a healthy and hearty breakfast , so that he can go on with his daily activities fully sustained and since it’s summer time, it means pool time, play time, so lots of exercise. Who doesn’t love pan cakes? We all do especially kids, they really enjoy them. I love to experiment with food and constantly think about ideas to make my food look good, taste good and also healthy at the same time. 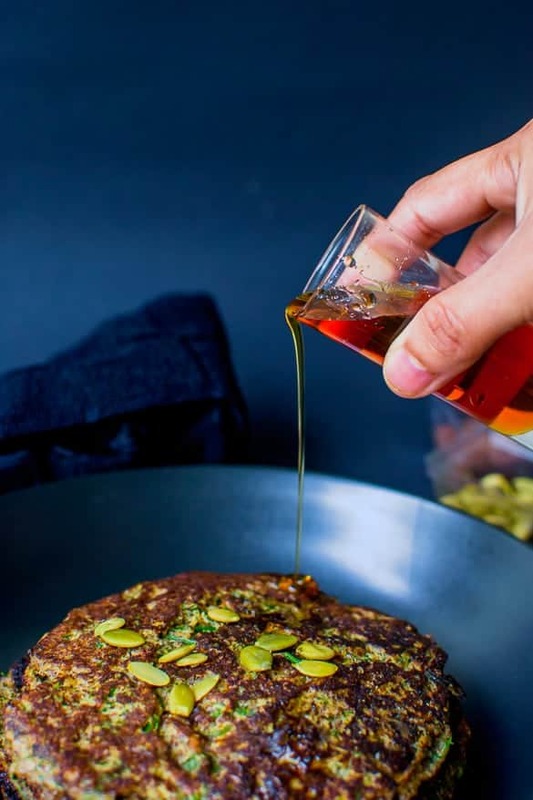 For this pancake recipe, I have used pumpkin seed flour and flax seed flour to make them completely gluten free and to also promote many of their health properties at the same time. Theses flour are completely optional, you can choose to replace them with any kind of nut flour if you wish. If you don’t like egg, skip it, no worries! Flax seeds flour is quite gelatinous therefor itself does the job of eggs (providing structure. I love an egg in my pancake for extra protein and with the use of dill this will make for a herbaceous breakfast on the go. Let’s prepare this easy and healthy pancake. Chop the dill leaves and mix together with all of the ingredients mentioned except the dairy free butter, in a big bowl. Aside the batter aside for 10 minutes. Heat a non stick skillet with the dairy free butter . Ladle some of the pancake batter and pour it in the center of the buttered skillet. Use the back of the ladle to spread the batter making it about 5 inches diameter. Let it cook on medium high heat for about 2 minutes on each side. Arrange the pancakes on a plate then drizzle with a low GI syrup of your choice and serve them warm. Hi , my name is Pooja , born in India and living in USA. Food wasn’t my passion until I came to USA. In India, I was working full time, so had very little time in my kitchen. I learnt my first steps in cooking from my grandpa . Though he was a doctor by profession, he was a very good cook. After coming to USA, I started full fledged cooking , and one day ,came up with an idea to start my own food blog. I got lot of inspiration from my husband and son. In spite of cooking and blogging, my hobbies are , doing crafts and painting.